Wow, it was a busy year in mobile, that's for sure. We saw the introduction of the Galaxy S III and the iPhone 5, two of the biggest handsets of the year, and Microsoft's release of Windows Phone 8. Meanwhile, RIM delayed BlackBerry 10 until 2013. We also saw the introduction of iOS 6 and Android 4.1 (and Android 4.2) Jelly Bean that are the best versions of Google's mobile operating system yet. It was an exciting year, that's for sure. Let's take a quick journey back at 12 of the biggest stories that occurred. This was such a big deal that I mentioned it in my top 10 tech blunders of 2012, too. RIM surprised the world when it decided to push BlackBerry 10, and its new smartphones, until next year. The company is in the middle of a heated battle with Android, Windows Phone and iOS, and the stakes are huge for its next platform. Will it be able to succeed? We'll have a better idea when the company lifts the curtain on Jan. 30. We knew it was coming, but that didn't stop this from becoming one of the biggest stories of the year. iOS 6 is Apple's latest mobile operating system, and it comes with major enhancements to Siri, a new Maps platform, Facebook over cellular support, changes to the email system, speed improvements and much more. Apple, unlike other firms, quickly made the operating system available for most of its older devices, too. Passbook and other features still need some work to become useful to the masses, but iOS 6 overall is a step in the right direction and helps the mobile OS remain one of the most powerful to date. Speculation around the iPhone 5 (read our review here) started almost immediately after the iPhone 4S launched. Actually, technically, rumors started spilling to the net after the iPhone 4 launched, but most of them were incorrect. The iPhone 5 introduced a beautiful new design that the world had never seen before, and it's so complicated that Apple's parts suppliers had a hard time keeping up with demand. The iPhone 5 is arguably the most successful smartphone Apple has sold yet, and it was introduced with a new Lightning port connector, a better camera, 4G LTE connectivity for the first time ever and much more. It was definitely one of the biggest handset announcements of 2012. The late Steve Jobs once said that Apple had no interest into moving into the smaller 7-inch range tablet space, but that's exactly what Apple did this year when it unveiled the iPad mini under the leadership of Tim Cook. It has its issues – we wish the display had a sharper Retina-worthy resolution, more RAM and a faster processor, but the 7.9-inch size makes it more portable than any iPad before it. Apple arguably launched the product to compete against $199 tablets from Amazon, Google, Samsung and other firms, but it priced the tablet at $329, which may be a bit steep for some consumers. We love the iPad mini, but still suggest you hang out for the second generation that will no doubt offer higher-specs and force Apple to drop the price of the current model. Samsung and Apple had a super long drawn-out battle in the court room. It was so in-depth that the presiding judge even asked that the two firms settle out of court. Apple eventually won and a jury ruled that Samsung owed the iPhone maker more than $1 billion in damages. Still, Apple pushed on to ban additional Samsung products and, the South Korea tech giant argued that the case was unfairly decided because the jury foreman had ties to Seagate, a Samsung partner. The judge recently tossed a few of those additional cases, but we wouldn't be surprised to see the two firms continue to go at one another's throats in the future, especially since Apple is currently trying to earn an injunction against the Galaxy S III and other devices. Samsung launched the Galaxy S III this year, and it took the world and Android lovers by storm. It still sells like hotcakes, even though speculation around the Galaxy S IV has already started. Samsung sold 20 million units in the first 100 days the device was on the market, and the phone launched on every major carrier in the United States including Sprint, T-Mobile, AT&T, Verizon Wireless and even a few smaller wireless providers. It is now being upgraded to Android 4.1 Jelly Bean, which introduces a ton of new features, and sits as one of our favorite devices as 2012. Android 4.1 Jelly Bean and, a few months later, Android 4.2 Jelly Bean, really showed what Google's mobile operating system is capable of. As we've said around the offices, it finally felt like Android had left beta form and became a truly robust and powerful mobile OS that's capable of competing against, and even overtaking, other platforms. Jelly Bean came with Google Search, which goes toe-to-toe with Apple's Siri, and Google Now, for up-to-date information on traffic, the weather, sports and so much more. Plus, "Project Butter" helped make the platform run smoother and quicker than ever before. 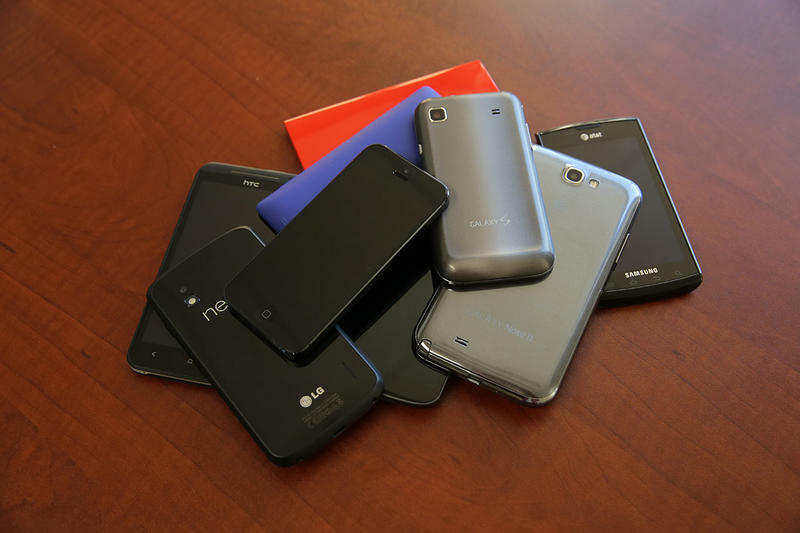 Android 4.1 is now available for dozens of smartphones and tablets, and Android 4.2 will bring its enhancements, including a new photo sphere feature and camera features (among other options) to devices in the new year. Google's Nexus 7 was unveiled before the Nexus 10 and the Nexus 4, and was the first Jelly Bean-powered device. It offers a 7-inch screen and came in at a stellar $199 price tag. Sure, Google eventually replaced the entry-level 8GB model with a 16GB option, which frustrated some consumers, but we're glad the price remained low. The device was joined by the Nexus 10 and the Nexus 4 just a few months ago, Google's 10-inch tablet and flagship Android smartphone, respectively, and all three now run Android 4.2 Jelly Bean. The Nexus 4 doesn't offer support for LTE networks out of the box, but its industrial design is stellar and it pushes the barrier of Android's capabilities farther than ever before. The Nexus 10 is powerful in its own right, and offers a large screen experience for those who want a bit more viewing space than the Nexus 7 offers. It's out top choice for large-screen Android tablets currently, but we're more attracted to the smaller Nexus 7. T-Mobile announced its intentions to acquire MetroPCS in October, after its failed merger with AT&T in 2011. The carrier hopes that the additional spectrum from the purchase will allow it to build out an LTE network to match those deployed by Sprint, AT&T and Verizon Wireless. If the merger is approved, and the FCC has suggested that it should be, T-Mobile will have an estimate 42.5 million subscribers and $24.8 million in revenue for the year. The deal is expected to close during the first half of next year. That's not the only deal going down, however. SoftBank also announced its intentions to acquire the majority of Sprint (70%) for $20 billion. The deal will also give Sprint the cash it needs to continue to expand its 4G LTE network and is expected to close in the first six months of 2013. Sprint, meanwhile, also announced its intentions to acquire Clearwire and its assets for $2.2 billion. Apple surprised, and upset, many of its users when it decided to replace Google Maps in iOS with its own Maps platform. That was a disaster, to say the least, that led to the termination of at least one Apple executive. Even CEO Tim Cook had to issue an apology for the mess. Apple's Maps are buggy, have directed people into dangerous situations and have fly-over views that look like a Salvador Dali painting at best. We know of more than just a few people who refused to update to iOS 6 until Apple Maps was replaced with a viable solution. Thankfully, Google recently saved the day and issued its own Maps application, which provides voice-guided turn-by-turn directions and a much more accurate experience. RIM's co-CEO's Jim Balsillie and MIke Lazaridis stepped down shortly after 2012 started, back on January 22. Both originally stayed on as board members, although Balsillie left the firm entirely on March 29, along with executives David Yach and Jim Rowan. It was somewhat of a sad day, since the two co-CEOs had been staples at RIM meetings and presentations for as long as we can remember. Thorsten Heins serves as the new CEO, but had to bring the bad news that BlackBerry 10 was delayed until 2013. Microsoft partnered with Samsung, HTC and Nokia, among others, to introduce Windows Phone 8 this year. We saw a brief unveiling on June 1, but the company officially showed us all of the features during an event in October. Nokia's flagship Lumia 920 and HTC's flagship Windows Phone 8X were the stars of the show, and both phones continue to impress us. It's the best mobile operating system from Microsoft yet, but the app selection still leaves a bit to be desired. Still, we can tell it's a step in the right direction and we're excited to see how Microsoft decides to tie it in with its desktop operating systems in the future. Google announced its intentions to acquire Motorola Mobility for $12.5 billion in August of 2011, but the deal was finalized in May of this year when Google announced that Dennis Woodside would replace Sanjay Jha as the firm's CEO. The acquisition came with additional costs, too. Google laid off 4,000 Motorola Mobility employees at a cost of about $300 million. It has since announced its intentions to sell Motorola Mobility's Home Business for $2.35 billion and even hired a top Samsung marketing exec, Brian Wallace, to work on the team. We're expecting big things from Motorola Mobility and Google in the new year. As you can see, 2012 was chock full of mobile stories that changed the industry forever. 2011 was no different, and we believe even more excitement will unravel in 2013, especially as we continue to see carriers merge and new platforms battle it out for the hearts of consumers. What were your favorite stories of 2012? What do you expect in 2013?